We offer an extensive range of remote visual inspection pipe inspection cameras, non-destructive testing NDT equipment, measurement equipment including laser alignment tools and thermal imaging cameras, and flaw detection equipment. Browse our full product range below. You can also search by equipment type or equipment use. If you can’t find the product you are looking for contact our friendly team. 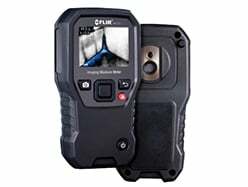 The FLIR MR160 Imaging Moisture Meter is the first of its kind. Equipped with a built-in thermal camera, MR160 is the only moisture meter with the power to show you exactly where to measure.